Someone Just Like You by Sol Yurick - reviews by Lehmann-Haupt and Joyce Carol Oates of The New York Times. Rage is the fuel that makes Sol Yurick’s fiction burn—a revolutionist’s rage at the bureaucratic machine that flattens people into forgotten file drawers. Rage was in his novel ‘Fertig,' about a man avenging himself on random people because a skip in the machine had destroyed his child. Rage spilled out of 'The Bag,' Yurick’s Dostoyevskian epic about the lower depths of a big-city welfare system. 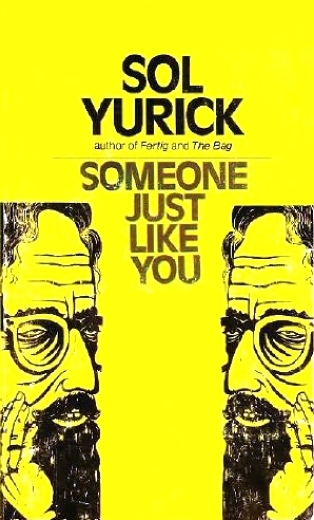 And rage bubbles everywhere in 'Someone Just Like You,' Yurick’s collected short stories. —Christopher Lehmann-Haupt, A Radical’s Inventiveness, New York Times, September 1, 1972. Few indeed can handle the densities and outrageous paradoxes of ‘real’ life. The straightforward sections of ‘The Bag’ and ‘Fertig,’ and the unfantasized horrors of this collection’s realistic stories, have a power to move us, urgently and deeply, that cannot be matched by any of the author’s superficially sophisticated contemporaries. —Review by Joyce Carol Oates, New York Times. September 3, 1972.